1. Since I spent the evening with Daryl Stuermer (Genesis/Phil Collins fame, anybody?) at Picnic with the Pops and not at or watching the game I was thinking of mixing up some Crew highlights to one of those early progrock Genesis songs. 1a. I'm not going to do that. But I will link to the really creepy 'Spitting Image' Land of Confusion video. 2. Caught the 2nd half of the (real) Real Madrid / Galaxy friendly. 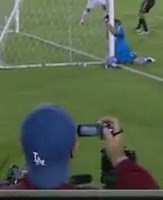 Ronaldo rolls in and generates the best goal on US soil this year. He beat 4 Galaxy defenders and sent LA 'keeper Perk face planting into his own near post. 3. Man Utd sold Ronald for a sum (81 million pounds) greater then all MLS salaries combined. It's interesting to ponder the fact that United could have covered the yearly salaries of all 528 MLS players this year with that one transfer. 2a. Liked following the comments on the MLS site while the Seattle / Colorado game was going on. I'm noticing more and more folks from Germany and England dropping by. They are enjoying MLS. It's refreshing. 2b. Don Garber believes that future riches are south of the border but they are probably in getting players from lower English and European leagues (Luke Rodgers type, not Beckham type). English and German fans will follow them. 2c. Schedule more games during the 1pm - 6pm EST time slot on the weekends. It'll allow Europe to tune in. Garber came over from the NFL, he should know this. 2e. I Reckon I need to organize my thoughts and post out 5 things to improve he MLS. 4. CREW stuff: Has Hesmer been making saves like this his whole career? No, at least not this consistently. He has always been an above average 'keeper. The saves he's made over the past few weeks are world class. I'm in the camp that thinks this is more then form. It is player improvement. He's at the stage in his career were he should be coming into his own. He is doing just that. Columbus will have to fight to hold on to him I think. What I saw in highlights last night was quality. 4a. I read that Iro and Griffit were hangin' in the Nordecke last night. What a great thing. Columbus loses a tad more players then some other clubs because the weather is rough, smaller city, no beach nearby or whatever. It's a hard fact for the team to come to grips with. Lots of young players on the team this year from the mid-west though. I think that goes a long way. 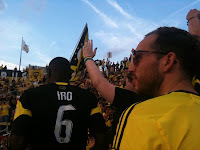 Iro showing love to Crew fans was just awesome. 4b. When I heard Iro was leaving the first thing I thought was "don't trade away players that like to live in your city" because the skill difference betwixt most players at this level is minimal. Iro often spoke about liking it here. You can't teach that to a player. It can be infectious, that attitude. I think Barros Schelotto brought that to the team. It creates a powerful symboyotic relationship with fans. It's one of the important ingredients it takes to win championships. If you're ever in Columbus around the end of the season stop by a Crew game on a chilly fall Ohio evening. Magic to be found there because of players like Iro. Best of luck to him. From where I stand he has a lifetime pass to return to Columbus for the class he showed last night. 5. Next level Genesis. Live at Shepperton, 1973. Life again destroys liiiifffe. Didn't realize Peter Gabriel and Phil Collins got that deep into progressive rock. Watcher of the Skies is epic.